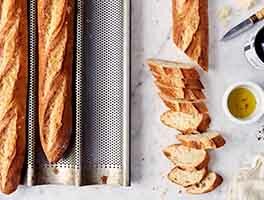 With their not-too-tough, crusty exterior and soft, tender interior, these baguettes are a softer, yet tasty, alternative to more traditional baguette recipes. 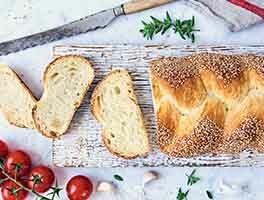 We like them whole for foot-long sandwiches; ripped into chunks for soaking up a saucy main meal, and/or sliced thin and toasted for a plethora of bruschetta toppings. 3 hrs to 3 hrs 35 mins. Mix together the water, orange juice, maple syrup, 6-grain flakes, and white whole wheat flour. 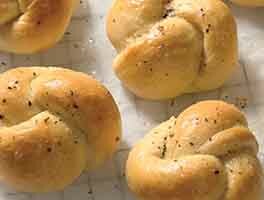 Mix in the yeast, and allow the soft dough to rest for 15 to 20 minutes. Stir in the remaining ingredients, and mix and knead — by hand, mixer, or bread machine — until you have a smooth, elastic, slightly sticky dough. Place the dough in a lightly greased bowl, cover, and let rise until doubled in size, about 90 minutes. 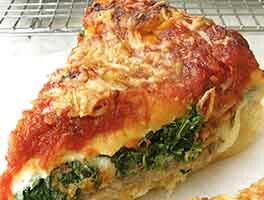 Gently deflate the dough, divide it into three equal pieces, and shape each piece into a flat 10" x 4" oval. Fold each oval in half lengthwise, and seal the edges with the heel of your hand. Flatten it slightly, then fold and seal on the other side. With the seam side down, gently roll each piece of dough into a 13" log. Place the logs seam-side down into the wells of a lightly greased or floured stoneware baguette baker. Cover the baker with the lid, and let the baguettes rise until very puffy, 45 to 60 minutes. Just before baking, remove the lid of the baker, slash the tops of the baguettes several times, and spritz with water. Return the lid to the baker and bake the baguettes for 20 to 25 minutes. Remove the lid and bake for 5 to 10 minutes longer. Remove the baker from the oven, and turn the baguettes out onto a rack to cool. 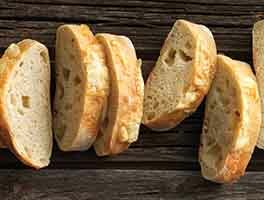 We highly recommend you use a stoneware baguette baker or baguette pan for this recipe. In a pinch you can bake these loaves on a parchment-lined baking sheet, but your crust won't be as crisp. This was fabulous, literally the best bread i've ever baked with kaftan. Complete keeper. This is a great recipe if you don't like your baguettes too crunchy. 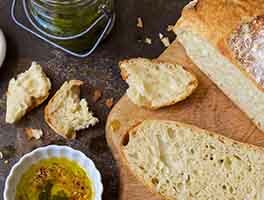 My husband likes soft bread - this is a nice compromise between a crunchy crust and too soft. Love the health factor, too! I think this will be perfect for picnic sandwiches - great size in the covered baguette pan for rolls - and they're sturdy enough to hold up to various fillings. Just ate one for lunch with Italian tuna in olive oil and it was perfect! Easy to make and great results!! I followed the recipe almost exactly (I had some 9 grain KA flour and subbed that for the 6). I do not have a covered baker, but used my baguette pan and covered it with a 1/2 sheet pan. The oven rise was poor, and the crust is non-existent. I even put them back into the hot oven in an attempt to get a crust. The crumb is also disappointing. I like to cook with whole grains, so I was delighted to see this recipe, but won't be making it again. Delicious and nutritious! I used a pan that holds 2 baguettes, so I shaped 2 ~11oz baguettes and baked them for 23 minutes. Nice lively dough, but not much oven rise even with steam pan . Left in oven with door open to cool . Tasty crust with added sesame seeds. Enjoying the hearty flavors. Delicious! This is a wonderful multi-grain version of baguettes, and the entire process was top-notch from start to finish. Great instructions, and the ingredient list told me I was going to like these even before actually tasting them. I followed the recipe ingredients and directions just as given, using a fresh-squeezed orange for the juice and KAF Vermont Maple Syrup. We baked the baguettes in our Emile Henry Baguette Baker (lightly sprayed with non-stick baking spray) using the times given. The crust is terrific and the bread is tender and has a delicious aroma...great for an afternoon snack with Irish cheeses and fresh blackberries. Thanks, KAF, for another GREAT baguette recipe!